Naming your TV show Intelligence is asking for it, really, like naming your band Melody or your restaurant Delicious. There’s no one to blame but yourself if you don’t bring the goods. You’ve drawn the bull’s-eye on your own back. In the case of the CBS techno-procedural that debuted a few weeks back, the title is halfheartedly intended as a pun: Gabriel Vaughn, our hero, is a former special-ops soldier with a microchip embedded in his brain. This makes him smarter, because Internet, and also he works as a super-spy, like Jason Bourne with Wikipedia instead of charisma. But Intelligence is such a clunky, dim-witted exercise that it’s hard to give it credit even for this marginal bit of wordplay. In the opening minutes of the pilot, Vaughan is intentionally captured by Pakistani security forces (they catch him while he’s using his brain to Google his missing, presumed-traitorous wife like a spurned ex drunk-surfing Facebook), promptly unlocks the doors holding him with his mind (because Internet), and then, seeing no better option for escape, jumps feet first off of a cliff. Unironic smash cut to the title card: Intelligence. A smart show would play this for laughs. But this, in case you haven’t gotten the idea, is not a smart show. Set in the present day, Intelligence concerns the shadowy, government-adjacent dealings of the U.S. Cyber Command, an organization I was truly shocked to discover wasn’t made-up. Vaughn is the agency’s crown jewel, a multibillion-dollar experiment designed to help conquer “insidious threats,” but only those that require Bluetooth connectivity: His artificially-enhanced OS gives him unlimited “access” to “the information grid” which means he can basically do everything your iPhone can, only hands-free. (Early episodes involve him snooping through people’s email, dialing bad guys’ cells, and the aforementioned locking and unlocking of doors — a package that in real life adds only $4.99 a month to your mobile bill.) When he’s not kicking, punching, and, presumably, playing Words With Friends, Gabriel can also create 3-D “renders” of events that are “part fact, part imagination” — a trick done much better by the brainier Sherlock. These CGI set pieces allow him to walk through a frozen, digital landscape in search of clues, a process that repeatedly had me searching for the fast-forward button. In the pilot, after he’s been fished out of the frozen river, Vaughn is described by his superior (a brittle Marg Helgenberger) as “reckless, unpredictable, and insubordinate.” This bit of exposition is nearly always unnecessary — what TV show has ever been about a rigid, rule-follower? 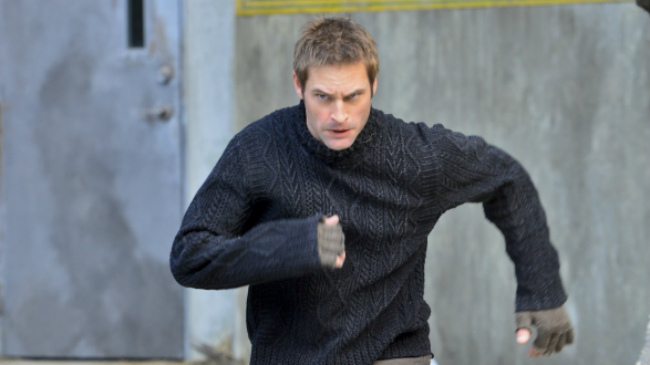 — but it’s made particularly redundant by the casting of Lost‘s wisecracking Josh Holloway as Vaughn. Even though he’s traded the Dharma scrubs for a sensibly corded sweater, it’s clear Holloway’s not much for following orders; the man is a walking raised eyebrow. In the right role — and he’s been searching for one ever since leaving the island — Holloway is a kinetic, charismatic actor. He’s uniquely talented at making the improbable seem natural — let’s not forget that this is a guy who turned a story about a time-traveling security guard into one of the greatest TV romances in recent memory. But he seems utterly flummoxed by Gabriel and his inconsistent abilities. (The Wi-Fi-enabled Vaughn is as context-dependent as Aquaman; God forbid he should ever be forced to save someone on the New York subway or, say, Bakersfield.) And any attempts to spark Lost-ian chemistry with Meghan Ory (as Riley Neal, a lithesome Secret Service agent tasked with protecting the government’s investment) are scuttled by the creaking machinery of Gabriel’s supposedly nimble mind: Every time he wanders off into cyberspace, the show grinds to a halt around him. If it’s annoying when your friend stops in the middle of the crosswalk to find a better restaurant on Yelp, can you imagine what it’s like during a gunfight in Syria? If anything, Intelligence is a throwback, clearly intended to be a sleek reboot of the sort of superheroic sci-fi that once ruled the airwaves. Think The Six Million Dollar Man, Knight Rider, Quantum Leap, etc. But those shows, silly as they may have been, made the future seem both exciting and tantalizingly present. Intelligence feels about as relevant as an AOL start-up disc. The contemporary “information grid” is certainly impressive and omnipresent. But it’s also utterly impossible, a constant shriekfest of dead ends, loose threads, kitten videos, and regret. I often find Twitter daunting on a Tuesday. Is it so hard to imagine that having one’s brain directly jacked in to the Web might be a tad overwhelming? Or exciting? Or awful? But Intelligence considers the implication of its hero’s gift with the sort of curiosity usually reserved for expense reports. Gabriel spews out facts like a search engine and turns every challenge into a video game. And for what purpose? Ultimately, Gabriel is just another government drone — albeit a reckless, unpredictable one — tasked with ridding the world of various types of menacing ethnics. After a while, watching the world’s most powerful weapon gun down a series of mute Pakistanis, Chinese, and Syrians is downright depressing. Big Brother isn’t just watching, he’s winning. Network TV is lacking a zippy spy procedural, and it’s fun just imagining a show that could harness Holloway’s outsize, Sawyer-y charm. (On Lost, Holloway had his hands in everyone’s cookie jar. As Gabriel, he knows the secret family cookie recipes.) Yet as I watched Intelligence veer from dull to aggressively stupid — last week’s episode featured CyberComm more or less starting a war in Syria and a CIA agent initiating a knife fight aboard a presidential plane (but hey, it also featured Tania Raymonde and Lance Reddick: Flight 815 reunion!) — I couldn’t help but mourn the way the show had failed its premise. There’s absolutely nothing compelling about watching a living browser check the (public!) alumni rolls of Rice University in search of a rogue scientist. Why couldn’t Gabriel be putting his hard drive to better and more entertaining use as a private investigator? Or a matchmaker (get Rob Thomas involved and you could call it OK Cupid)? Or the most successful blueshirt in the history of the Geek Squad? There’s actually a rich and welcome vein of camp running just beneath the show’s technobabble and militaristic jargon (“I need to get your people in a box!” fumes Helgenberger. “This is a wet op!” seethes Reddick. “404 page not found,” says I), but Intelligence is too wedded to its analog machismo to even consider it. Case in point: The inventor who “made” Gabriel is named Dr. Shenandoah Cassidy. Dr. Shenandoah Cassidy! And yet no one even bats an eye. Do you think Gabriel has access to The Onion? Or has humor been firewalled along with common sense? Call yourself whatever you want, Intelligence. Just don’t insult ours.